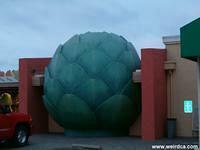 Castroville, the Artichoke Center of the World, not surprisingly plays host to the "World's Largest Artichoke". Built in 1972, at 20 feet tall and 12 feet wide, the artichoke made out of concrete and re-bar stands before a local business aptly named "The Giant Artichoke". The restaurant and giant artichoke were created by Ray Bei. Artichokes at the restaurant are served in a variety of ways including but not limited to: frozen, fried, quiched and steamed. 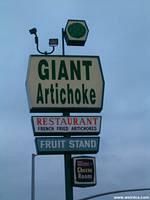 The Giant Artichoke stands near the intersection of 156 and 183, pretty close to where 156 becomes route 1. Monterey County produces almost all of the United States artichokes. Since the 1920's Castroville has grown artichokes. The first ones were grown by Andrew J Molera in 1922. The Castroville Artichoke Festival happens in May and has been going on for over 55 years. California produces nearly 100% of the artichokes in the United States, and 80% is grown in Monterey County. 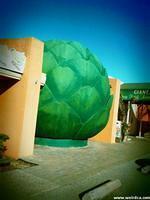 As a result, Castroville declared itself the "Artichoke Center of the World". However, outside of the United States, Egypt, Italy and Spain are the primary producers of artichokes, all three growing far more than California does. Drawings and displays of artichokes can be found all over the town of Castorville, on the signs, on the benches at bus stops, etc. They are a fully integrated part of most "decoration" in the town of Castroville. There is a mural directly around the corner from the Giant Artichoke. The mural, shown above left, is described thus "This mural celebrates the history of the artichoke industry circa 1940's-1950's in Castroville. Known as the artichoke capitol of the world, this beautiful coastal community enjoys a moist microclimate that is ideal for the cultivation of artichokes. Local workers are depicted harmoniously performing various tasks of the period from cultivation to transportation, including the hand harvesting of artichokes in sacks, a method still in practice today. Depicted in the mural is the refrigerated technique used to transport artichokes by train. Blocks of ice were manually loaded into ice sheds, crushed in a chipping machine, and sprayed into train boxcars to preserve fresh artichokes for shipping. The background scenery depicts Castroville's early history of the grazing and dairy industry as shown by the Royal Creamery and the lush rolling fields of the Castroville region." My sister in law lives in the alleyway directly behind the giant artichoke. This has been a local hit for years! 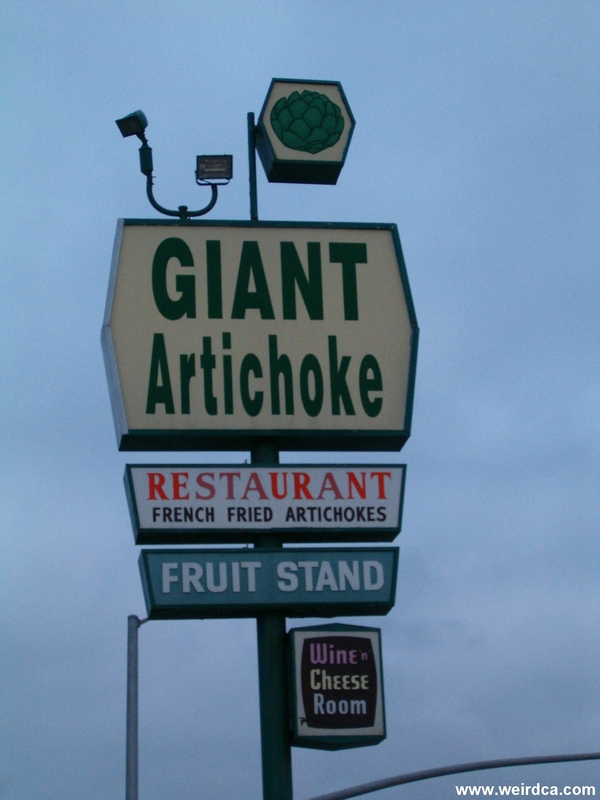 Just remember the place is all family owned, but if you plan on eating there eat at the wine and cheese deli section of the giant artichoke. They have the best deep fried artichokes and sandwiches California has to offer. John Madden often stops here when passing through with his bus. This was really cool. I went and saw this last year (2007). I have been that way many times, but did not know about it till i read about it in the book and saw it on the web.